MILWAUKEE, WI--(Marketwire - April 28, 2008) - Although the dreaded April 15 tax filing deadline has passed, you still have time to put your W2s and 1040s to good use. Information from these and other tax forms can help you take advantage of a new calculator on HSAInsights.com, which shows you what you could save by switching from a traditional health plan to a high deductible plan with a health savings account (HSA). An HSA is a consumer-managed, tax-favored alternative to traditional health insurance created for the purpose of paying medical expenses. HSAInsights.com is a Web site that helps individuals, families, employers and retirees understand the basics of HSAs and gives them resources, tools and guidance for making smart choices. The Web site's latest tool, the Health Savings Account Comparison Calculator, can be used by site visitors to calculate their potential cost savings with an HSA based on their insurance premiums and medical expenses from the previous year. Employees who have their premiums withdrawn from their paychecks can find these numbers on their W2 forms. Individuals who are able to deduct medical expenses can get this information from lines 1-4 of Schedule A, Form 1040. The new calculator also factors in your share of medical expenses and the tax savings on your HSA deposits to estimate your net annual savings. By collecting information on your plan's details, premiums and expenses the calculator can provide you with the total savings you would achieve with an HSA. For many families with annual medical expenses of about $1,500, the total savings often exceed $6,000 a year, which includes tax reductions of $1,500 or more, as well as premium savings. In addition, the HSAInsights.com Web site features another calculator that lets users determine the potential future value of their HSAs based on their expected contributions and expenses. "With the impact of taxes still fresh on everyone's mind, now is a great time to start planning to ease your tax burden for 2008," said noted industry expert Scott Krienke, senior vice president, individual markets for Assurant Health, the first company to offer an HSA. "Health plans with HSAs offer protection and a tax-free way to invest -- all at a cost that usually is less than what purchasers would pay for a traditional plan." 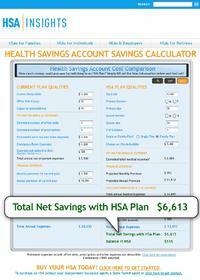 These innovative, interactive planning tools can be found by visiting http://www.hsainsights.com/HealthSavingsAccountCalc.aspx (or via our home page at http://www.hsainsights.com). HSAInsights.com, a Web site that helps individuals, families, employers and retirees understand the basics of HSAs, introduced today an interactive Health Savings Account Comparison Calculator. This tool enables people to calculate the potential cost savings with an HSA based on insurance premiums and medical expenses from the previous year.